I found something interesting in Yahoo Widgets. 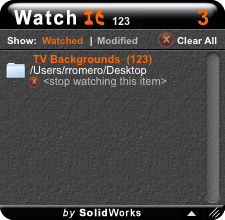 Surprisingly there is a widget created to monitoring Solidworks Files. You can use this utility to monitor changes to files. It is great for teams working with data stored in a shared folder. Simply drag that folder onto this Widget and you will be alerted when any files in that folder are modified. You can also open the changed file directly from this Widget.